"I was trying to find something to cook when I found this recipe in the back of my mom's recipe box. I loved it and so did my mom! The nuts are optional. Hope you enjoy it!" Preheat oven to 325 degrees F (165 degrees C). Lightly grease and flour two 8x4 inch pans. In a large bowl, cream together the sugar and butter until light and fluffy. Stir in the eggs one at a time, beating well with each addition. Stir in the banana and sour cream. In a separate bowl, combine the flour, baking soda, baking powder, cinnamon and pecans; stir into banana mixture, just until combined. Pour batter into prepared pans. Bake in preheated oven for 55 to 65 minutes, until a toothpick inserted into center of a loaf comes out clean. Remove from pan and place on a wire rack to cool. Serve warm or cold. 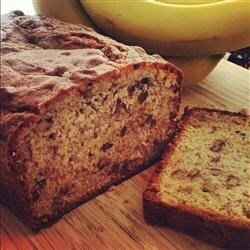 See how to make super-moist banana bread with concentrated banana flavor. You can use chopped walnuts instead of pecans, too. Very good moist bread. I used only 2 cups sugar and used about 3 cups of banana as well as 1 1/2 tsp of vanilla extract. This recipe with a few tweaks is now the family favorite. I used self-rising flour and omitted the baking soda and powder. This was a very moist and flavorful bread. I may add a little more sugar next time, though. This is THE best Banana Nut bread ever!! Every single time I make, everyone goes crazy for it! I put a little tiny bit more sour cream and I actually add chocolate chips. It's a total hit!